This will prevent Kari from sending you messages, friend request or from viewing your profile. They will not be notified. Comments on discussion boards from them will be hidden by default. 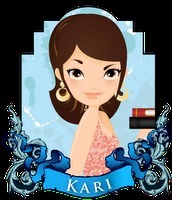 Sign in to Goodreads to learn more about Kari. Act Like It is the first book in the London Celebrities series. The book features two London stage actors who must pretend to be in love in order to save the reputation of the play they are wok ring one. The problem is that Richard and Laini can't st Act Like It is the first book in the London Celebrities series. The book features two London stage actors who must pretend to be in love in order to save the reputation of the play they are wok ring one. The problem is that Richard and Laini can't stand each other. Love and Pancakes is the first book in the Rockland Falls series. This is Marissa and Rhenn story. Marissa's life goes up in smoke when her family's bed and breakfast has a fire. Rhenn is hired to do all of the new wiring for the rebuild. I thought t Love and Pancakes is the first book in the Rockland Falls series. This is Marissa and Rhenn story. Marissa's life goes up in smoke when her family's bed and breakfast has a fire. Rhenn is hired to do all of the new wiring for the rebuild. I thought this was a really cute love story. Both Rhenn and Marissa are relationship shy having dated cheaters in the past. I loved how Rhenn made Marissa feel like she was the only woman in the room. She had always lived in her sister's shadow and her confidence wasn't too high at first. These two were made for each other. Endurance is the third book in this series and the one I have liked the least. Have you ever seen the X-Files episode "Home"? Were you completely grossed out by it? If your answer is yes, then you should avoid this book. I thought Trapped was at peak Endurance is the third book in this series and the one I have liked the least. Have you ever seen the X-Files episode "Home"? Were you completely grossed out by it? If your answer is yes, then you should avoid this book. I thought Trapped was at peak grossness level, but no, Endurance topped that one. I'm not squeamish, but this one made me a bit nauseous as I read it. I can't really say that I enjoyed it. For me, it was a little over the top. Maybe don't read this one on your lunch break. We’d love your help. Let us know what’s wrong with this preview of Endurance by Jack Kilborn. We’d love your help. Let us know what’s wrong with this preview of Afraid by Jack Kilborn. We’d love your help. Let us know what’s wrong with this preview of Haunted House by Jack Kilborn. I never though in a million years would I ever say I liked a character like Timothy Blake. Why? Because he is the most likable cannibal I have ever read about. Yes, Timothy Blake is a cannibal. He is also a brilliant puzzle solver and last resort for I never though in a million years would I ever say I liked a character like Timothy Blake. Why? Because he is the most likable cannibal I have ever read about. Yes, Timothy Blake is a cannibal. He is also a brilliant puzzle solver and last resort for the FBI when solving hard cases. And despite being a sociopath, he's actually pretty likable. He has an agreement with parts of the FBI that for every case he solves, he gets to have criminal up for execution. We’d love your help. Let us know what’s wrong with this preview of Hangman by Jack Heath. We’d love your help. Let us know what’s wrong with this preview of The Birthday Girl by Sue Fortin. A common group for everyone that posts on The Wagon bulletin board to discuss their books. Kari has read 69 of 250 books. Kari read 276 books of her goal of 225! Kari read 246 books of her goal of 225! Kari read 255 books of her goal of 200! Kari read 257 books of her goal of 250! Kari read 282 books of her goal of 250! Kari read 296 books of her goal of 250! Kari read 289 books of her goal of 250! Kari read 287 books of her goal of 240! Take a look at Kari’s Year in Books. The good, the bad, the long, the short—it’s all here.